Our Automotive Network of sites delivers more buyers and sellers than anywhere else. By advertising with Australia's number one classifieds marketplace, you will have access to millions of people who are engaged and qualified. Advertise your inventory in Australia's largest automotive classifieds marketplace. Gain access to leading inventory and enquiry management system, Autogate. Manage your online business, all in one central location. With over 100 industry specialists in the field, our Network provides all the support you'll need to be successful on our sites. Choose from many additional tools and professional services that can help you take your online business to the next level. How does Carsales Network operate? 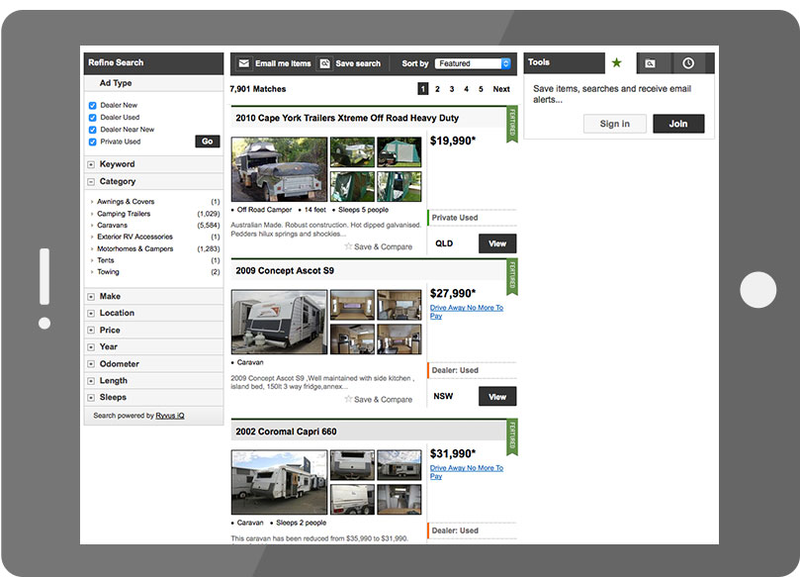 Carsales network is unique in its approach to selling inventory online. For the buyer it is all about the inventory item regardless of the seller. Therefore we do not display the seller's details until the buyer has placed an enquiry on that particular item. This is classified as a lead for the seller. This lead can be placed via an online enquiry or via phone, both are located on the details page of the inventory item. Any lead is then located against the inventory item within the Autogate lead management system. Who can advertise on the site? Licensed dealers may become account holders within the Carsales Network by signing up via the online Master Agreement. Private sellers may also list on a per inventory items basis. What is a pay per enquiry model? The pay per enquiry model means the dealer pays for each customer enquiry they receive on a specific inventory item listed for sale. This is an effective billing model because the dealer only ends up paying on based on the number of enquiries they receive per ad. Your monthly fee covers unlimited inventory items, Autogate licence which assists in loading all your inventory items online and Lead management, Account Management and Help Desk Assistance. A written 30 days' notice is all that is required should you wish to cancel the service. I use a Dealer Management System; can I feed my stock directly to carsales.com.au? For dealers who are currently utilising a Dealer Management System (DMS) to manage their stock, we can facilitate a direct data feed from your DMS, through Autogate, and straight onto your chosen website. Currently we work with over 20 DMS systems in the Australian automotive market. How do I access my enquiries? Like with inventory, all enquiries are also filtered and stored in your Autogate account. Here you will be able to access, contact, manage and report of every enquiry that comes through carsales.com.au. What happens after you accept the Terms and Conditions? A representative will be in touch to get you started and help you with your initial upload of inventory items.